iTunes error 9006 may appear when attempting to download, restore, or update an iPhone or iPad. Typically you’ll see an iTunes error message that states something like “There was a problem downloading software for the iPhone. An unknown error occurred (9006).” or you’ll notice an “err = 9006” message alongside a stopped or failed download of an iPhone software update. Usually iTunes error 9006 can be resolved with some simple troubleshooting steps, allowing the user to update iOS on their iPhone or iPad without incident rather quickly. Though not always the case, error 9006 is typically triggered by an inability to connect to the iOS software update servers, either causing a failed download or interrupting a download. This is why software firewalls and anti-virus apps are usually the first thing to blame, though sometimes the issue can be a broader internet problem or even specific to a computer, iTunes version, OS version, or network. 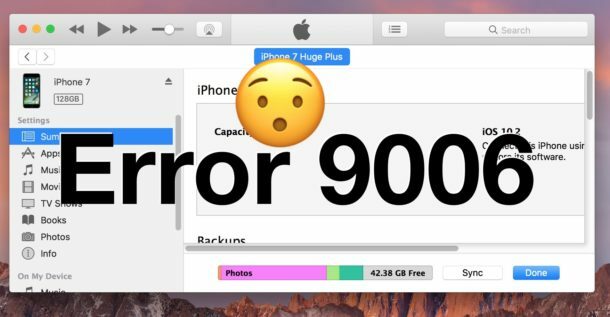 Try the following tips to resolve error 9006 in iTunes if you encounter the error problem when updating iOS system software. A more advanced solution is available for users who are comfortable using IPSW files and getting deeper into the weeds of iTunes, essentially it’s two parts; removing the failed IPSW file and then re downloading a new one and using that to update the iPhone or iPad. Did the solutions work to resolve the iTunes error for you? Do you know of another method to fix iTunes error 9006? Let us know in the comments below. Antivirus and firewall is often the problem for updates. Macs don’t need antivirus. Macs don’t need anti virus, no they need anti malware, Mac keeper is malware on macs, so is the malware that sets up a users account and keeps you from getting online, I have to fix so called macs don’t get viruses on macs everyday :). Works for me! Thanks, after having trouble for quite a few weeks. Great. Download while connected to the internet with NO firewall or virus protection! What was that number of seconds from connecting to the internet and the first malware attack again? it says to disable just the firewall portion of the antivirus, not to completely disable the antivirus. Antivirus software does not protect against Malware. That’s a big misconception. It also interferes with Mac updates because it thinks it’s an attack. Indeed, it can come bundled with Malware itself or be toxic to the Mac – think Mackeeper! If malware is the problem, install Ghostery and Adblock plus and use Malwarebytes Antimalware App (free) to get rid of any. Perhaps that is relevant with a Windows PC if you are browsing oddball things and downloading gibberish. But with a Mac or a Windows with careful browsing, you can avoid most junkware, malware, virus, etc. But you are missing the point here, which is to download the iPhone update with the firewall turned off, then install the iTunes update. Then you can re enable your firewall if you want. If the firewall is causing you download problems, what else are you going to do? I have seen error 1 when my iPhone cable was bad, try a different iPhone cable and different USB port.